Optical position tracking and inertial orientation tracking are well established measurement methods. Each of these methods has its specific advantages and disadvantages. 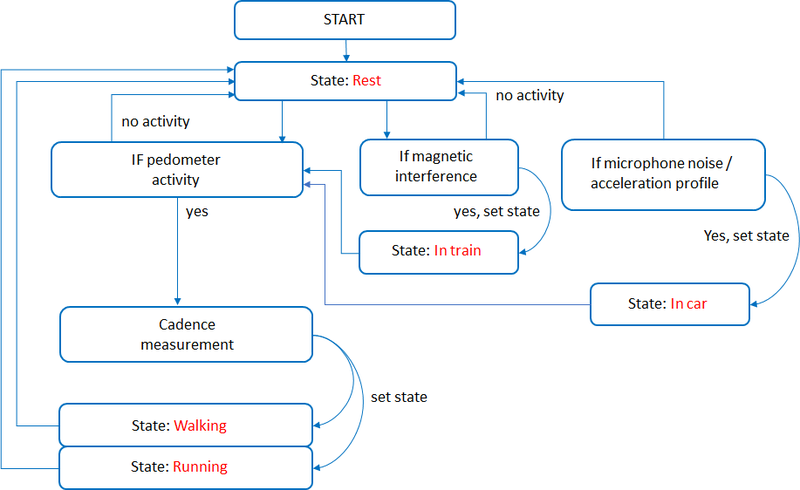 In this post we show an opto-inertial sensor fusion algorithm that joins the capabilities of both to create a capable system for position and orientation tracking. The reliability of position and orientation data provided by an optical tracking system (outside-in or inside-out) can for some applications be compromised by occlusions and slow system reaction times. In such cases it makes sense to combine optical tracking data with information from an inertial measurement unit located on the device. 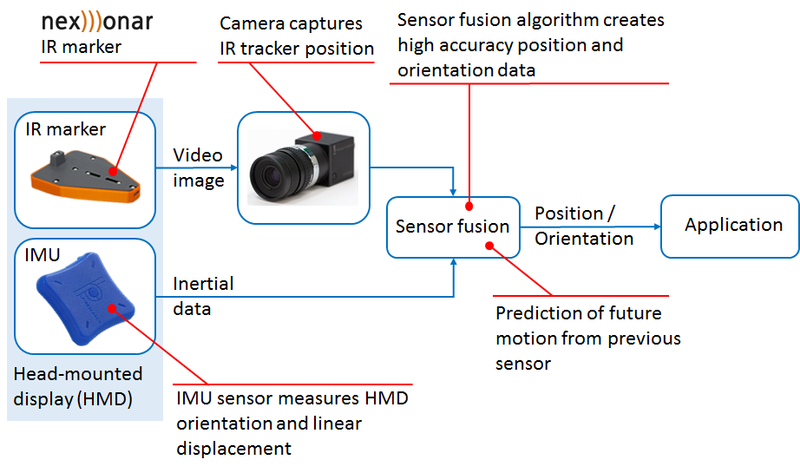 Our optical-intertial sensor fusion algorithm implements this functionality for integration with an existing tracking system or for the development of a novel system for a specific application case. The graphs below show two examples of how the signal from an optical positioning system can be improved using inertial measurements. 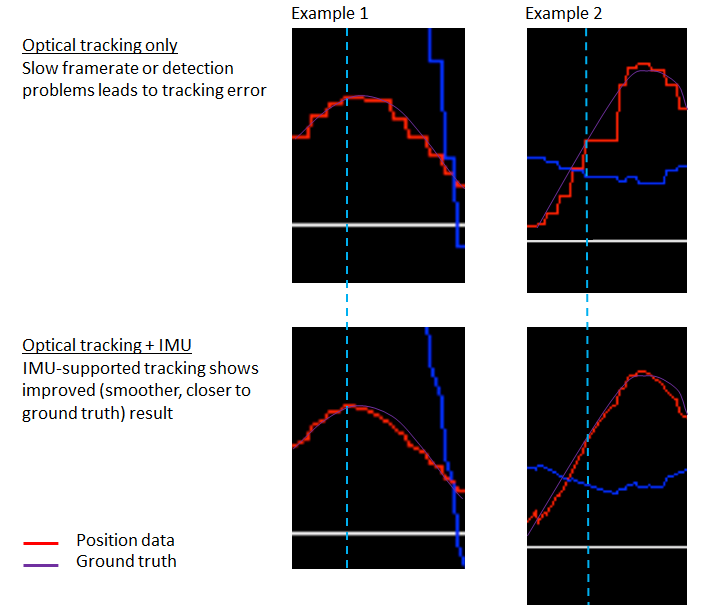 Slow camera framerates or occasional drop-outs are compensated by information from the integrated inertial measurement unit, improving the overall tracking performance. For a demonstration, we combined three NEXONAR IR trackers and an LPMS-B2 IMU, mounted together as a hand controller. The system allows position and orientation tracking of the controller with high reliability and accuracy. It combines the strong aspects of outside-in IR tracking with inertial tracking, improving the system’s reaction time and robustness against occlusions. 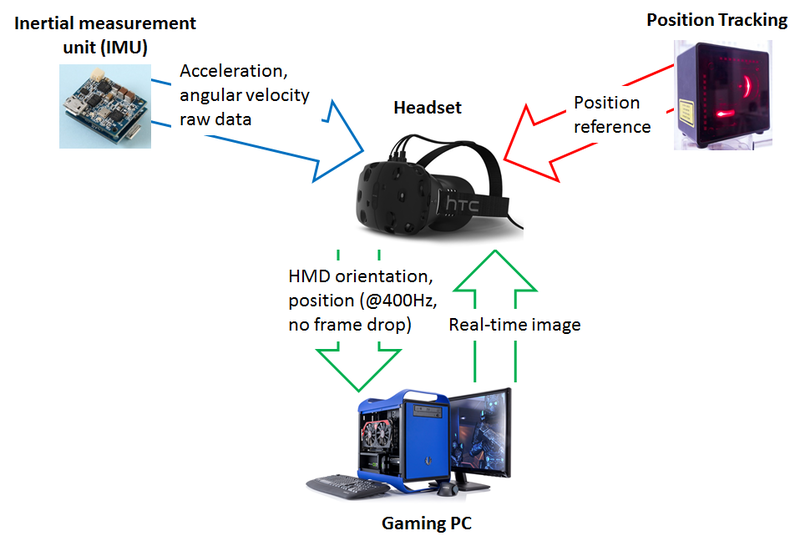 The tracking of virtual reality (VR) headsets is one important area of application for this method. To keep the user immersed in a virtual environment, high quality head tracking is essential. Using opto-inertial tracking technology, outside-in tracking as well as inside-out camera-only tracking can be significantly improved. Robot Operating System and LP-Research IMUs? Simple! Robot Operating System (ROS) is a tool commonly used in the robotics community to pass data between various subsystems of a robot setup. We at LP-Research are also using it in various projects, and it is actually very familiar to our founders from the time of their PhDs. 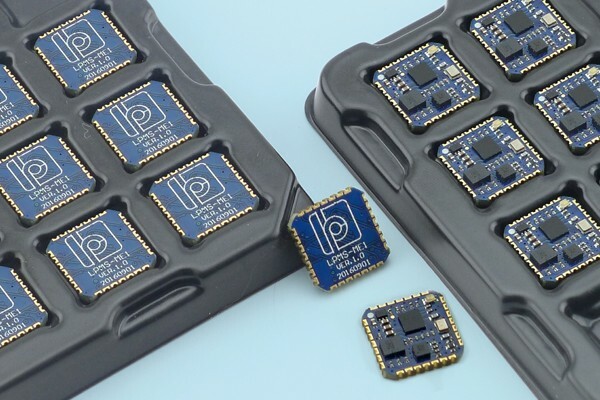 Inertial Measurement Units are not only a standard tool in robotics, the modern MEMS devices that we are using in our LPMS product line are actually the result of robotics research. So it seemed kind of odd that an important application case for our IMUs was not covered by our LpSensor software: namely, we didn’t provide a ROS driver. We are very happy to tell you that such a driver exists, and we are happy that we don’t have to write it ourselves: the Larics laboratory at the University of Zagreb are avid users of both ROS and our LPMS-U2 sensors. So, naturally, they developed a ROS driver which they provide on their github site. Recently, I had a chance to play with it, and the purpose of this blog post is to share my experiences with you, in order to get you started with ROS and LPMS sensors on your Ubuntu Linux system. I also installed libbluettoth-dev, because without Bluetooth support, my LPMS-B2 would be fairly useless. If you don’t already have a working ROS installation, follow the ROS Installation Instructions to get started. If you already have a catkin work space you can of course skip this step, and substitute your own in what follows. The work space is created as follows, note that you run catkin_init_workspace inside the src sub-directory of your work space. We can now download the driver sources from github. It optionally makes use of and additional ROS module by the Larics laboratory which synchronizes time stamps between ROS and the IMU data stream. Therefore, we have to clone two git repositories to obtain all prerequisites for building the driver. This should go smoothly. Time for a test. Not as Cool as LpmsControl, but Very Cool! Now that we are set up, we can harness all of the power and flexibility of ROS. I’ll simply show you how to visualize the data using standard ROS tools without any further programming. You will need two virtual terminals. In the first start roscore, if you don’t have it running yet. In the second, we start rqt_plot in order to see the data from our IMU, and the lpms_imu_node which provides it. In the box you can see the command I use to connect to my IMU. You will have to replace the _sensor_model and _port strings with the values corresponding to your device. Maybe it’s worth pointing out that the second parameter is called _port, because for a USB device it would correspond to its virtual serial port (typically /dev/ttyUSB0). rosrun rqt_plot rqt_plot &amp; # Wordpress sometimes (but not always!) inserts "amp;" after the ampersand, if you see it, please ignore it. rosrun lpms_imu lpms_imu_node _sensor_model:="DEVICE_LPMS_B2" _port:="00:04:3E:9E:00:8B"
rosrun rqt_plot rqt_plot &amp; # Wordpress sometimes (but not always!) inserts "amp;" after the ampersand, if you see it, please ignore it. 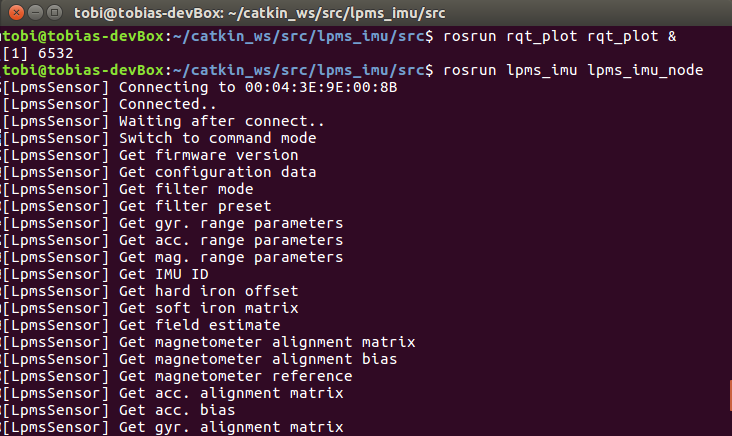 rosrun lpms_imu lpms_imu_node _sensor_model:="DEVICE_LPMS_B2" _port:="00:04:3E:9E:00:8B"
Once you enter these commands, you will then see the familiar startup messages of LpSensor as in the screenshot below. As you can see the driver connected to my LPMS-B2 IMU right away. If you cannot connect, maybe Bluetooth is turned off or you didn’t enter the information needed to connect to your IMU. Once you have verified the parameters, you can store them in your launch file or adapt the source code accordingly. The lpms_imu_node uses the standard IMU and magnetic field message types provided by ROS, and it publishes them on the imu topic. That’s all we need to actually visualize the data in realtime. Below you can see how easy that is in rqt_plot. Not as cool as LpmsControl, but still fairly cool. Can you guess how I moved my IMU? Please get in touch with us, if you have any questions, or if you found this useful for your own projects. Update: Martin Günther from the German Research Center for Artificial Intelligence was kind enough to teach me how to pass ROS parameters on the command line. I’ve updated the post accordingly. New Miniature Sensor In: LPMS-ME1 Maker Edition! The LPMS-ME1’s Maker Edition is miniature-sized with just 12 x 12 x 2.6 mm. We proudly present you our latest development! The LPMS-ME1 is our smallest motion sensor so far, with just 12 x 12 x 2.6 mm it is tiny! 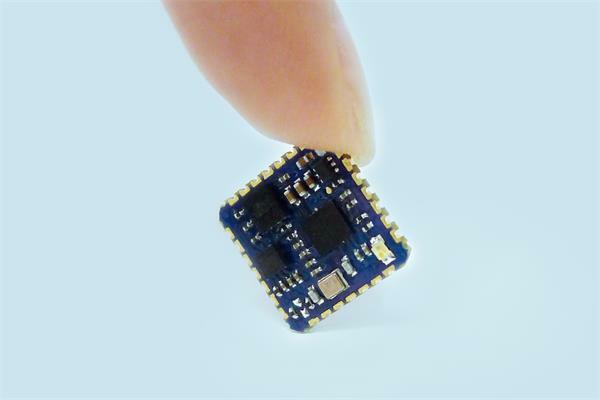 Despite its size this powerful 9-axis inertial measurement unit (IMU) has several sensors integrated, for example a 3-axis accelerometer, a 3-axis gyroscope and a 3-axis magnetometer. And this miniature motion sensor certainly comes at low cost. It is very easy to assemble and can be conveniently embedded in the system of your choice. Due to its size it is perfect for your design ideas and development projects. Just to to give you some inspiration, it can be used for human motion capture or sports performance evaluation, for various sorts of Internet of Things (IoT) devices, and can be used to control unmanned aerial vehicles. You can even fly a drone with it! Have a look at more specifications in our data sheet. This sensor comes with our own LpmsControl utility software and a one-year warranty service. Get the LPMS-ME1 Maker Edition for your own innovations! Find a distributor of your choice or order online at Zenshin Tech. Machine learning and artificial intelligence (AI) are important methods that allow machines to classify information about their environment. 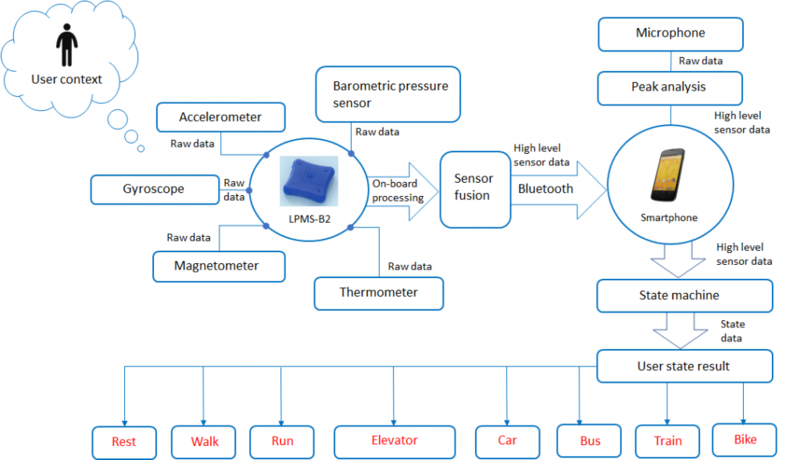 Today’s smart devices integrate an array of sensors that constantly measure and save data. On the first thought one would image that the more data is available, the easier it is to draw conlusions from this information. But, in fact larger amounts of data become harder to analyze using deterministic methods (e.g. thresholding). Whereas such methods by themselves can work efficiently, it is difficult to decide which analysis parameters to apply to which parts of the data. Using machine learning techniques on the other hand this procedure of finding the right parameters can be greatly simplified. By teaching an algorithm which data corresponds to a certain outcome using training and verification data, analysis parameters can be determined automatically or at least semi-automatically. There exists a wide range of machine learning algorithms including the currently very popular convolutional neural networks. To illustrate the results for deterministic analysis vs. machine learning approach we first implemented a state machine based on deterministic analysis parameters. The result is a relatively complicated state machine that needs to be very carefully tuned. This might have been because of our lack of patience, but in spite of our best efforts we were not able to reach detection accuracies of more than around 60%. Before spending a lot more time on manual tuning of this algorithm we switched to a machine learning approach. The eventual system structure looks noticeably simpler than the deterministic state machine. Besides standard feature extraction, a central part of the algorithm is the data logging and training module. We sampled over 1 milion of training samples to generate the parameters for our detection network. As a a result, even though we used a relatively simple machine learning algorithm, we were able to reach a detection accuracy of more than 90%. 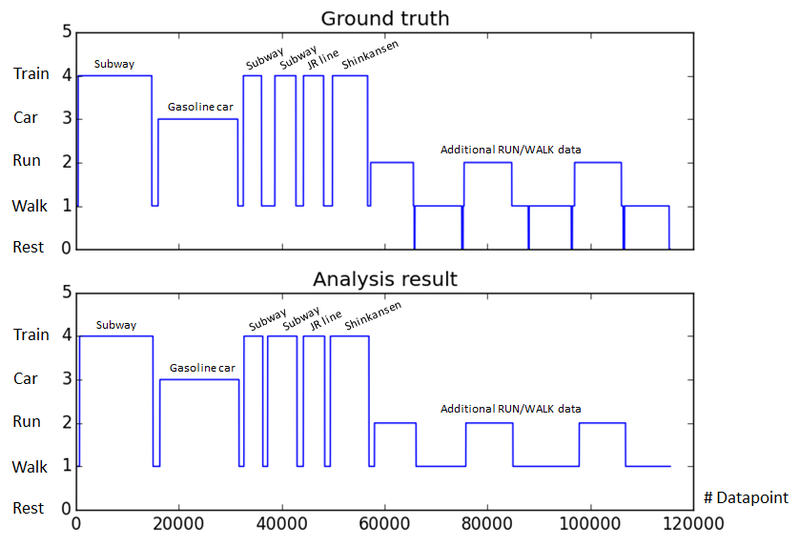 A comparison between ground truth data and classification results from raw data is displayed below. We strongly belief in the use of machine learning / AI techniques for sensor data classification. 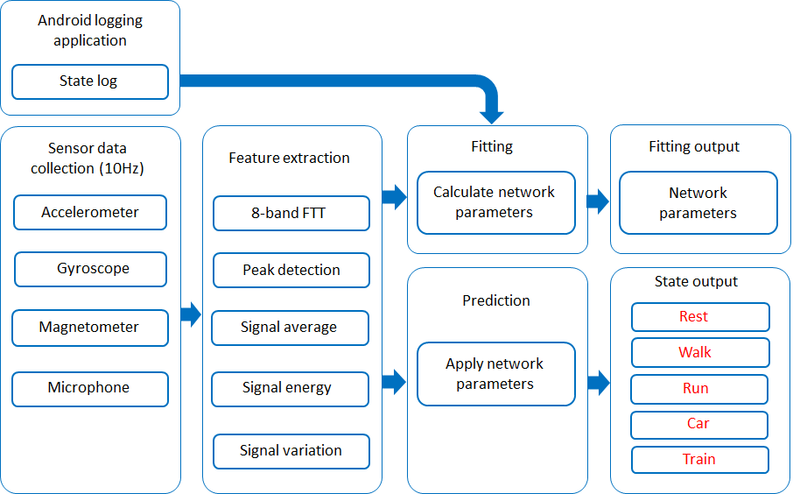 In combination with LP-RESEARCH sensor fusion algorithms, these methods add a further layer of insight for our data anlysis customers. If this topic sounds familiar to you and you are looking for a solution to a related problem, contact us for further discussion. Getting our IMU sensors online has just become so much easier. 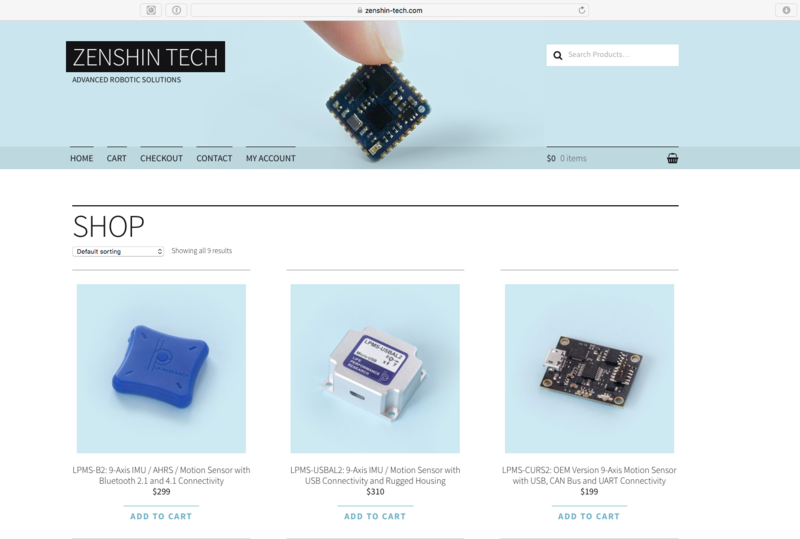 Create your own innovations and simply order at our new worldwide distributor: Zenshin Technology Ltd is an online shop operating from Hong Kong. Have a look at our next generation IMUs and explore the optimized features of for example, the LPMS-CURS2 (9-axis motion sensor with USB, CAN bus and UART connectivity) or the LPMSs-CANAL2 (9-axis IMU with CAN connectivity and waterproof housing). Copyright © 2019 LP-RESEARCH. All rights reserved.